I have lived in many places in my life – sometimes you can pass through a place, even live there for a good chunk of time, without the place grabbing much of a hold on your memory and other places dig deep roots into your heart, even in a short stay. And the place that prompted me to write is one that dug deep. It was nice to get a chance to go back recently, even briefly, and check how the town and some of the people that I know are faring. Living now in the Chicago area, there isn’t much contour to our prairie, but this area has plenty of hills and valleys. 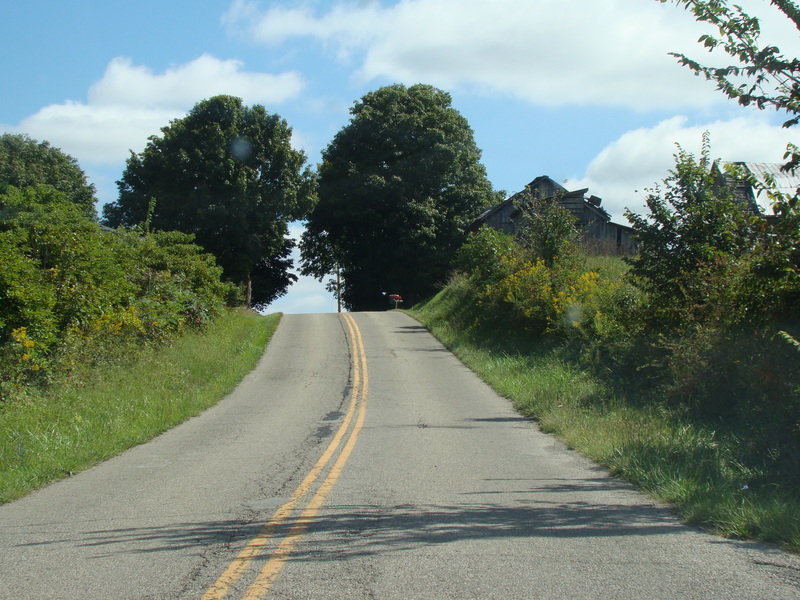 Some of the state routes and other roads connecting towns used to be 2 lane back roads with character including twists and turns – but over time through government investment, need due to heavy use, and hard work of construction workers these routes and roads have become 4 lane highways and therefore been straightened out and lost character. It is now faster to get from one place to another, and you don’t have fear what might be taking that next curve wide, but the scenery is blander. Progress seems to smooth out personality. I’ve noticed that this seems true with clothing and buildings as well. Look at items that were made painstakingly by hand in previous centuries and you will see intricate work that we don’t see in many of our modern items – straighter lines, more uniform. I know this thing, if not clearly anymore, I know it viscerally. This is where the old road went that way. This is where the door used to be. Even if you haven’t lived many places I bet you can identify – think about when you have visited some place and found that they have similar street names. Which makes you think twice as hard to get from A to B – is it your usual A to B, or a different one that should not overlay existing information? Names are the same, but contours and results are quite different. We know it, but we don’t and it is disorienting. Our brains stutter to gain certainty – this, no that, um. Breathe, not panic. Familiar, why? What fits with what? Set aside the unknown for a moment, focus on the known – even vague misty known. And click. Understanding starts, disorientation recedes. I am here, now. Whew.